Guest Post Series: Faces of Spring, Alice from "Alice Yeh"
Hi! My name is Alice, a Belgian twenty-something-year old that's passionate about all things beauty. I believe that beauty has the power to create a better version of ourselves, empowering us to conquer the world. Aside of being a student, I'm sharing this passion for beauty in my free time with the rest of the world in my blog Alice Yeh. As Sara is leaving on holidays, I was more than glad to share a few of my spring faves with you. As much as I adore autumn and summer, I get genuinely most excited about spring. Finally able to wave goodbye to the shivering cold and lifeless trees, ready to welcome the comforting warmth and blooming nature with wide-open arms. A new season also means a new wardrobe, and this includes my indispensable MUJI drawers in which I’ve mostly added glow-inducing products so far. Here are some new and revisited faves. Dior Glow Maximizer Light Boosting Primer a recent and rather pleasing acquisition that imparts the face with a proper glow. A pearl liquid with micro flecks of gold shimmer that ensures an oomphed-up luminous finish rather than one that makes you sport an unappealing greasy look. This primer is the first step to revive dull and lifeless skin, ready to make it shine in an attractive kind of way. As if that’s not enough, I sometimes add a few dustings of TheBalm Mary Lou Manizer highlighter on top of my cheekbones, under the brow bone and in the inner corners of my eyes. I have no idea what took me so long to get on board with this product, but it’s definitely worth the hype. It provides a lovely sheen to the face without being able to detect obvious chunks of glitter. It looks natural and makes light dance graciously on my face. Brows are here to stay and Burberry Brow Definer in Ash Brown has not left my side ever since I got it. Eyebrow pencils with a slanted tip facilitate the job remarkably being an absolute no-brainer to use. Ash Brown is the best colour match I’ve found so far: ashy with no red undertones. Natural defined brows or full-on brows? The choice is yours. 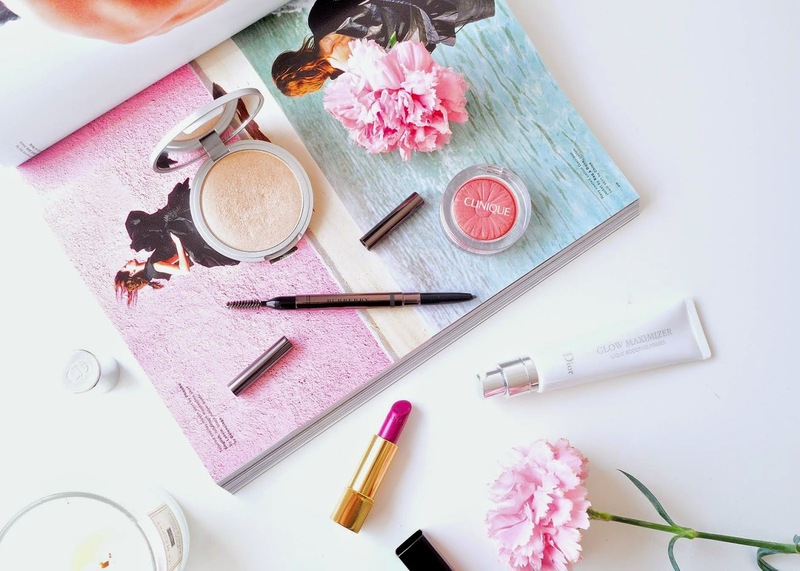 Clinique Cheek Pop in Peach Pop has been crowned as a must-have spring blusher in my books. A daisy-embossed blusher that has literally stolen my heart. Not because of its looks only, but the formula may just be the best thing out there: soft and smooth, which just seems to melt into the skin leaving no traces of powder. A powder that translates into a satin and luminous finish with no speck of shimmer in sight. Peachy with a radiant finish may just be a universal match made in heaven for spring. Lipstick is the finishing touch to every look and Chanel Rouge Allure in Rayonnante has been my lip of choice lately. A lipstick that instantly perks up your skin thanks to the vibrant fuchsia shade mixed with a pinch of purple, instantly reminding me of purple tulips. The formula is all kinds of awesome as well, on which all desired adjectives apply: creamy, pigmented, opaque, long-lasting, non-drying, comfortable with a satin finish. It now lives permanently in my handbag, are you surprised? I love Alice! All your picks look fabulous, that Chanel lipstick is seriously gorgeous! Wow you look really beautiful!! That shade of lipstick really suits you! I haven't tried any of the products you've mentioned so this was a really interesting read! Beautiful look! And wow that Clinique blush - looks gorgeous! This is such a gorgeous look! I love The Balm's Mary Lou-manizer and that Clinique blush, too. Though, I might have to check out that Chanel lipstick. It's far too pretty!